Italian Greyhounds are teensy versions of their larger Greyhound cousins. Sleek, fast, and friendly, they have been the graceful subject of many renowned Renaissance paintings. The breed is often confused with Whippets, but IGs are even smaller. Italian Greyhounds are the littlest among the sighthounds or gazehounds—dogs who spot their prey and sprint to catch them. They can run at speeds up to 25 miles per hour, which makes them exceptional contenders in the sport of lure coursing. They have been beloved as pets as far back as 2,000 years ago, when they were bred as companions for nobility in the Greek and Turkish regions of the Roman Empire. IGs are loving and playful with their family, but often shy and reticent with strangers. They are athletic and lively, but should be supervised during playtime to avoid injuries. Italian Greyhounds are known as Piccolo Levriero Italiano in Italy. They're also often called IGs and Iggys for short. Coat - Italian Greyhounds have a short, glossy coat that lays flat and is silky to the touch. According to the American Kennel Club (AKC) standard, IGs can be any color and have any markings, except brindle and the tan markings that are found on other black-and-tan dog breeds. Italian Greyhounds have been human companions for two millennia, likely helping people hunt small game originally. They appeared throughout Europe by the Middle Ages and were particular favorites among Italian nobility. Iggys were prized companions and, along with their masters, the subjects of many paintings by famous Renaissance artists, including Pisanello and Giotto di Bondone. The breed gained popularity with the British nobility in the 1600s, and were cherished by Mary, Queen of Scots, Charles I, and Frederick the Great of Prussia, among others. The breed was registered with the American Kennel Club in 1886. Italian Greyhounds bred in the US helped revive the breed in Europe, after it faced near extinction there during World Wars I and II. The affectionate and lively Italian Greyhound has a silly side and is known to clown around the house to grab attention. Between bouts of goofiness, he is mellow and ready to sit in your lap for hours on end. Iggys can be on the sensitive side, so use a gentle approach for training and corrections. Are Italian Greyhounds Good with Kids? Yes. Italian Greyhounds are loving with the children in the family. They do best with older children who know better than to roughhouse with them. Iggys are fragile and can be unintentionally injured during boisterous play. Are Italian Greyhounds Good with Other Pets? Italian Greyhounds are good with other dogs and pets with whom they've been raised. A large, exuberant breed is not an ideal housemate for the IG, however, because of the risk of unintentional injury. Italian Greyhounds are devoted to their families, but they are not especially protective. Are Italian Greyhounds Good Guard Dogs? Italian Greyhounds are alert and will announce anyone approaching their house with a bark that is surprisingly loud coming from such a little dog. Though they can make good watchdogs, they are too little and sensitive to be intimidating guard dogs. Iggys are energetic and love to zip around the yard or house. They toggle between fits of energy and naps throughout the day. They are difficult to housetrain. The breed is highly sensitive to certain forms of anesthesia and insecticides. They are prone to broken bones, especially as puppies. They are athletic and agile and can jump onto tables or over fences. They will chase birds and squirrels, so should always be leashed. A secured yard is required for an IG, so he doesn't run into the street. They are standoffish with strangers. They don't adapt well to time alone. Indoor The delicate Italian Greyhound is safest and happiest living inside with his family. They make good apartment dogs, but must be taken out frequently to get adequate exercise. The short, fine coat of the Iggy sheds very lightly, so fur clean up is minimal. They are difficult to housetrain, so until they get the hang of it, expect to clean up accidents. Outdoor Italian Greyhounds love spending time outside when the weather is pleasant. With their low body fat and thin coats, they require a dog jacket when it's cold or rainy. Iggys benefit from a well-secured yard in which to race around, but shouldn't be left alone outside. They will try to find a way out to get to you or to chase birds or even cars. 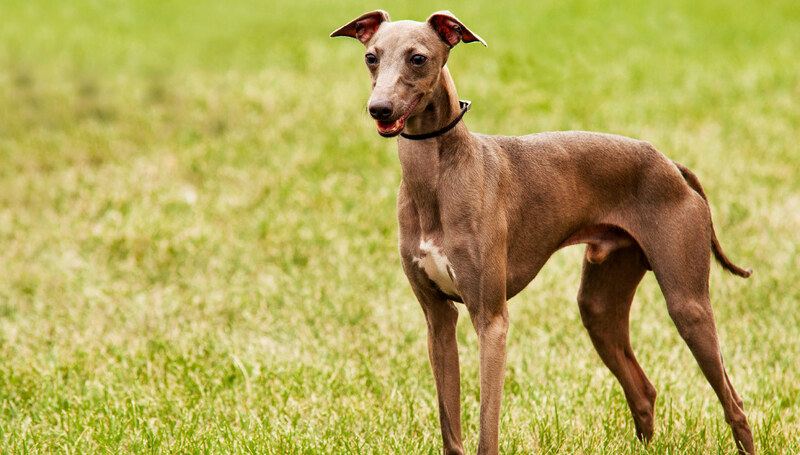 Exercise Italian Greyhounds need about two hours of running and playing each day. Their exercise is usually spread throughout the day, punctuated by long naps, preferably on your lap. Endurance Iggys have the stamina to zip around the yard and play tug-of-war for 30 minutes to an hour, after which they'll want to take a break. Running Miles: Italian Greyhounds are sprinters rather than distance runners. They will dash across the yard with you or down the street, but they don't make great running partners. Hiking Miles: The Italian Greyhound's fine coat does not protect him from brambles and sticks. It's best to stick to the easy trail with your Italian Greyhound, and make sure he is wearing a dog coat if it's cold. Food Generally, this small breed requires only about 1/2 to 3/4 cups of good quality dry dog food each day, given in two feedings. This will vary, however, based upon your Iggy's activity level and age. Talk to your veterinarian about the optimal diet and quantity of food for your IG. Alone Time Italian Greyhounds don't enjoy alone time, and no amount of behavior training will make them tolerate it peacefully. With too much solo time, Iggys may become hyperactive and/or develop separation anxiety. You can leave your Iggy alone for an hour or two, tops. They are comforted when they have a dog crate to relax in with a favorite dog toy or two. Italian Greyhounds have easy-care coats that require only occasional brushing, and bathing when they become dirty. Their teeth should be cleaned with care regularly because they are prone to periodontal disease. Clean your IG's ears with a gentle, dog-friendly cleanser to prevent dirt buildup that can cause infections. Finally, trim his nails every month or so to prevent cracking. You can minimize serious health concerns in an Italian Greyhound by purchasing from a reputable breeder who engages in responsible breeding practices, and through screening for common diseases and conditions. Italian Greyhounds are notoriously difficult to housetrain, but they eventually get there as long as training is patient and consistent. They learn basic commands quickly, especially when the training is fun and sessions are kept short. Agility training, dog sports, and lure coursing training mean spending time with their people, so Italian Greyhounds are fully on board. They are quick studies, but take care in training sessions with your Iggy, because he can injure easily when the activity gets overly rambunctious. Though they are sighthounds, Italian Greyhounds are too fragile for the field and don't make valuable hunting companions. Yes. The Italian Greyhound's single coat is short and fine and, as a result, they shed very lightly. No dog is considered 100% hypoallergenic, but fur and dander are so manageable with IGs that they come close. With their sprinting speed and muscular bodies, it's easy to imagine the Italian Greyhound as a bouncing, hyperactive dog. While some IGs may become hyper when they are left alone too long, they are not generally excitable if given plenty of attention and exercise. When at home IGs tend to be couch potatoes. Do Italian Greyhounds Like to Swim? Italian Greyhounds may splash around in the shallows, but this is not a dog who takes to water like a fish. They get cold quickly because of their low body fat and shouldn't spend much time in the water, even if you have the rare IG who actually enjoys swimming.